Truffles are better ripe than large! 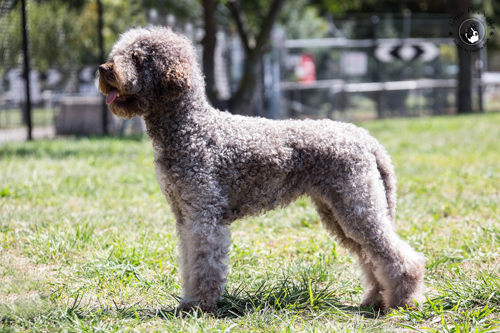 Truffle dogs are trained to truffle hunt only for ripe truffle and as such they are the best noses to detect the Black Perigord Truffle that is ready for harvest. 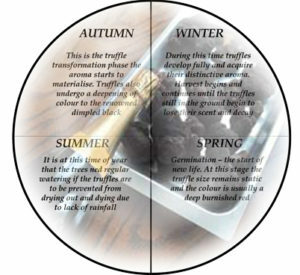 Truffle smells differently during each stage of its development. During Autumn, the Macenmist truffle dogs are not interested in the truffle as they are not ripe. 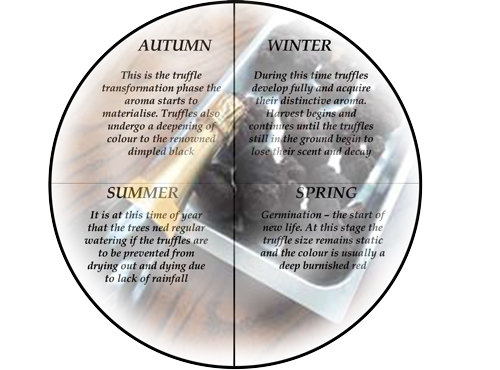 The stages of truffle growth that occur throughout the year are shown in the diagram (click on the image for a bigger version). We don’t get too enthusiastic when we see a truffle emerging above ground during Autumn as this is not an indication of a ripe truffle. What this is indicative of, is that the truffle is either growing near the soil surface, or if you are lucky – it could be a record weight or number of truffles! If we detect the possibility of truffle we do not disturb its resting ground – we carefully cover it over so that insects and atmospheric exposure do not affect its ripening. Then we walk away and wait for the dogs to let us know we have a ripe truffle. 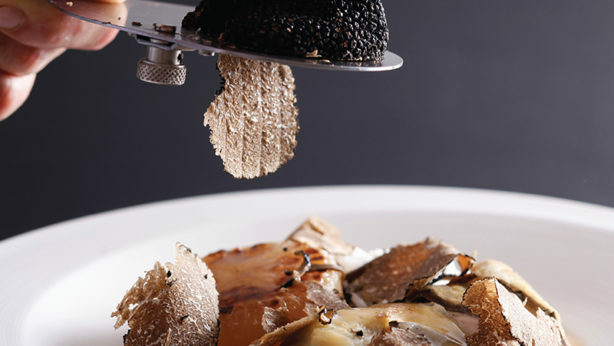 Very rarely, the truffle could be disturbed and broken from the fine trees roots that are its home. We understand that this can happen and know that it is a loss – we will never be able to use it, even for truffle infusion. We work on the principle of leaving it to ‘rot’ in the ground and that the spores will continue to survive, encouraging another truffle to emerge from the same tree.